GPoS Touch Screen Software is a versatile graphics-based Point-of-Sale product compatible with most leading manufacturer's touch screen hardware. Being PC based, GPoS is capable of delivering “Legacy” ECR speed along with the advanced flexibility of a PC based product. GPoS is a PoS system that caters for NOW and the future. 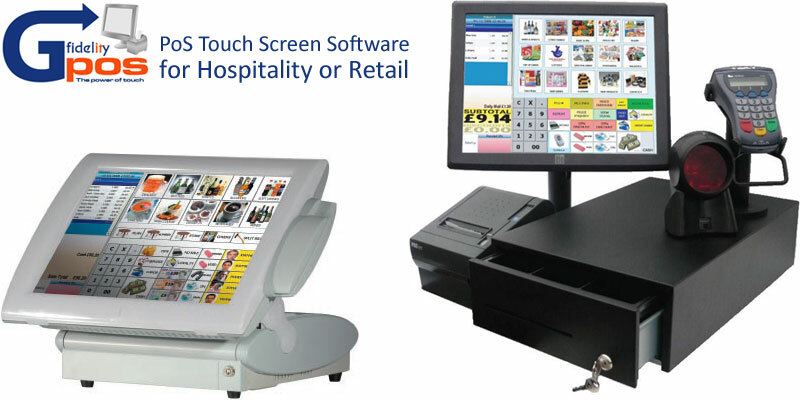 GPoS will run on most leading manufacturers touch screen terminals including machines by Aures, IBM, J2, Panasonic, Partner Tech, Protech, Sharp, Toshiba & XN. 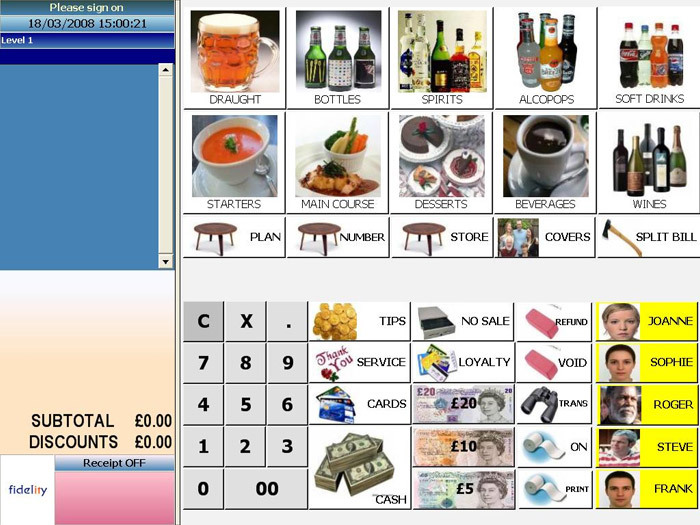 GPoS features a graphical user interface that can be easily customised. This graphical system reduces the training time for operators and makes it virtually language independent as each screen is fully user configurable. GPoS is a totally stand-alone application with it’s own set of reports and complete database management, and fully supports PLU creation, touch screen design and reporting. Multiple POS terminals can be linked and the database replicated across some or all terminals, allowing for different screen designs across a venue. 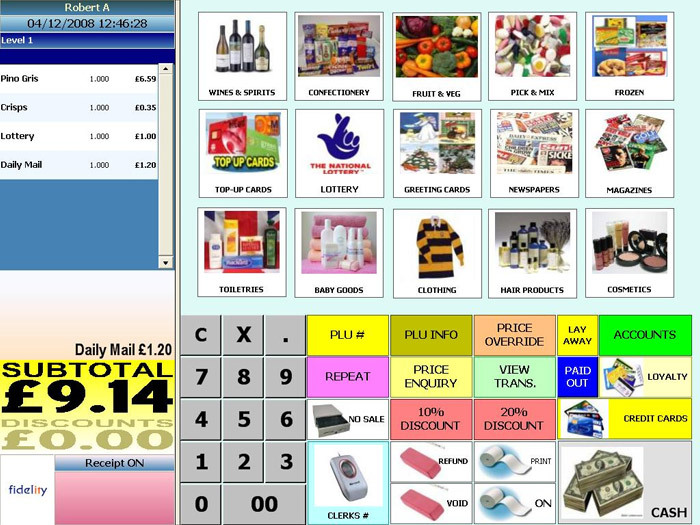 This makes GPoS on it’s own an exceptionally powerful and affordable POS system by itself. For even more functionality, GPoS integrates with Total Control Premier back office to create a true multi site, multi user and multi tasking product with many advanced features such as KPI’s (Key Performance Indicators), full graphical analysis and a report generator. 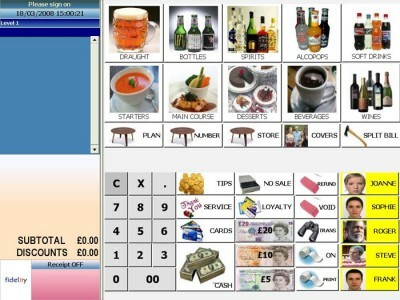 GPoS features a graphical user interface that can be easily customised. This graphical system reduces the training time for operators and makes it virtually language independent. The product buttons are infinitely variable in size enabling the system to be fully customised for your needs, giving unlimited functionality. Complete control over button attributes; change size, position, colour, font, image etc. Personalised start up screens for each clerk to reflect their responsibilities / roles. 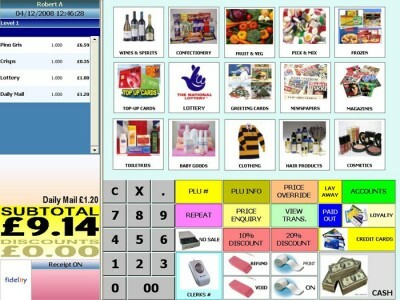 Uses graphics on buttons to aid accuracy of product registration. Stock count down can be displayed on screen against selected products. This feature enables staff to see at a glance how much stock is available for certain items. Typical uses are for speciality or promotional products which have their own hard PLU’s on screen. Usually used in conjuction with debit cards, this feature reduces the amount of cash in the drawers resulting in lower banking charges. Graphical representation of the restaurant with up to ten levels dramatically speeds up transaction times and ensures everything is billed correctly. The use of colour coding enables staff to easily view all tables at a glance, allowing them to see the current state of all transactions. Each PLU can have it’s own information or prompt screen. The prompts can pop up automatically against each PLU to instruct staff to inform customers of promotions, or can simply be viewed by the use of a PLU Info button on screen for product information.The information can be printed for the customer using the receipt printer. Discount cards – offer a straight discount attached to a card for privileged customers. Simple loyalty points – allow customers to gain points based on their spending habits.Points can be redeemed as a part payment against future sales. Different customer accounts systems can be interfaced directly to GPoS via Plug in code technology . Plug-ins are available for Total Control, Sage Line 50 and other third parties. Comprehensive mangement reports are available either from the touch screen terminals or from the back office programmimg utility. For a simple installation no further back office software is needed.